Young America (Metcalf) High School* "Golden Eagles"
Metcalf (population 213) is located in eastern Illinois in north-central Edgar County. Metcalf is about 25 miles southwest of Danville and 35 miles southeast of Champaign. Further information on the town of Metcalf can be read on the Metcalf High School page also on this site. The towns of Metcalf and Hume supported their own high schools from the late 1800s through the late 1940s. A state-wide push was made to consolidate the country schools with the larger schools in established towns. 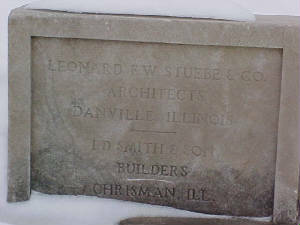 This effort also included the towns of Hume and Metcalf, as well as the township they are located in, Young America. In 1949 this effort became a reality when Young America High School was established. 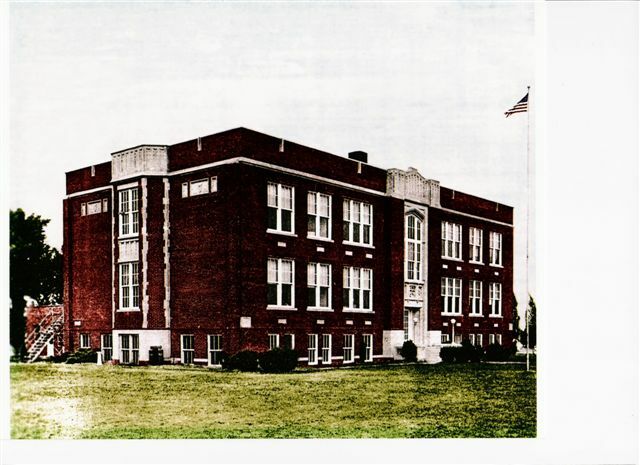 The high school was located in the Metcalf High School building. The Junior High was located in Hume. Basketball games were played in the Hume School gymnasium. Young America High School served the towns of Hume, Metcalf, and the surrounding farm kids for 19 more years. It was in the late 1960s that another round of consolidation talks began in the area. In 1968 a new school district was formed between the towns of Brocton, Hume, Metcalf, and Redmon. This effort joined the schools of Young America and Brocton-Redmon which resulted in the formation of the Shiloh School District. The Young America High School building (built in 1921) was fazed out of usage and, after serving for a period of time as a nursing home, unfortunately burned down. 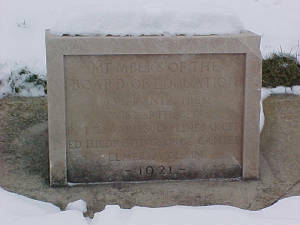 The memorial stones pictured above are the only reminder of this once proud school building. Young America HS Team nickname: the "Golden Eagles"
School Fight Song: "YA Fight Song"
March on you "Golden Eagle Team"
Young America High School offered basketball, track & field, and baseball (fall and spring). Football was also offered for a short period of time. Young America competed in the Ambraw Valley Conference along with Brocton-Redmon, Chrisman, Kansas, Scottland, and Westfield. It is not known for how long this conference existed, but it was in effect for sure from 1948 through 1968. 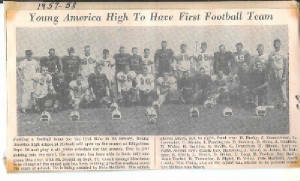 Young America HS played football for two years, 1957-58 and 1958-59. 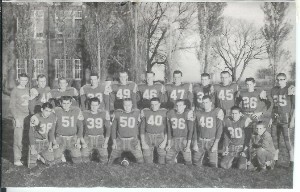 In 1957, because the Ambraw Valley conference members did not play football, YAHS also joined the East Central Conference and was a dual conference school from that point until it closed. As with most of the smaller schools, basketball was the most anticipated and supported sport at Young America HS. This was with good reason. 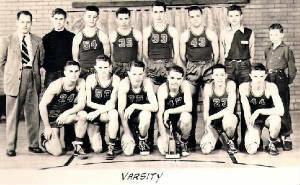 The Young America High School Golden Eagles won a total of three District titles in what was a real hotbed of small school basketball. One of the more interesting facts of YAHS basketball is that one of Illinois High School's most successful coaches began his career there. You can read more about Coach Roger Beals below. As you can see, the Young America kids went out fighting with winning records in each of their last four seasons as a high school. "The winner of the Ambraw Valley Conference Tournament always advanced to the Wabash Valley Tourney which was western Indiana schools, we are just 20 miles or so from the Indiana line. 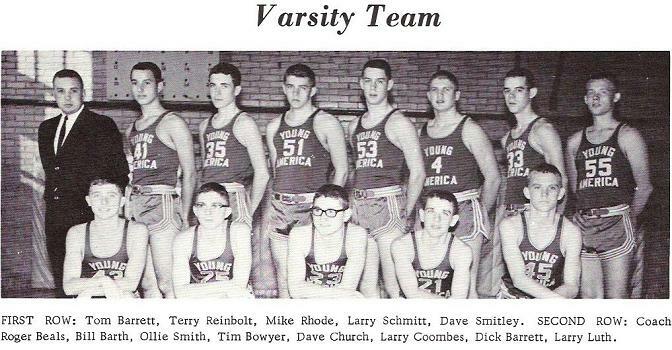 One year the Ambraw winner, Kansas (led by center Dave Redmon and former Paris great - Coach Warren Collier), was beaten by 2 points in the Wabash Valley Championship game by Terre Haute Gerstmeyer AND that year Gerstmeyer went on to place second in the Indiana State Tournament...."
Coach Roger Beals began his legendary coaching career during the 1962-63 school year. 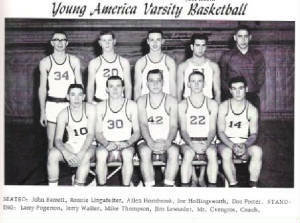 After his two initial campaigns began with sub-.500 records, Coach Beals led Young America to four consecutive winning seasons to close out the school's basketball history. In fact Coach Beals never had a losing record in any single season again. Coach Beals went on to coach at Mid-County Varna for a year before landing at Chrisman High School in 1969. Check out some of Coach Beals more incredible accomplishments in IHSA history. And it all started for Coach Beals at Young America High School! The football program at Young America High was a short one. For two seasons (one of which existed of one game) the Eagles battled with foes on the Autumn gridiron. 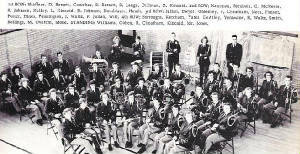 The boys of 1957-58 and 1958-59 had the numbers, but were not supported by school administrators. After a short life, the football program at Young America High School was dropped for financial reasons. 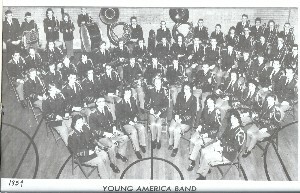 "Young America was probably better known for a remarkable music department and won many band sweepstakes trophies in state music competition mostly under the direction of Music Instructor Ernest Jones." A newspaper article submitted to us by Carolyn Stone Pennington reports that Young America High won top honors in the 1959 Trenton State Music Finals! The championship did not come without a little behind the scenes excitement. Bill Stone, the father of Carolyn Stone, was serving as driver / chaperone for the team and was the proud father of three daughters (Carolyn, Charlotte, and Sharon) who were members of the band. Upon arriving at the site of the competition in Trenton Carolyn informed her father she had forgotten her clarinet sheet music at home. Without it the clarinet trio set to perform would be unable to compete. Band director Mr. Ernest Jones who was able to get the clarinet trio's assigned time moved back while Mr. Stone was sent on a mission to buy the correct music "across the bridge" into St. Louis, Missourri, the closest music store in the area. Bill Stone was given the directions by Mr. Jones and had to decipher between the three bridge crossings that could take him into St. Louis that day. Bill was resourceful and was able to find the music store and return to the competition with time to spare. The Clarinet trio of Carolym Stone, Kathy Galway, and Larry Fogerson received a superior rating for their performance and the band won the championship by one point, 70 - 69 over Lovington. Bill Stone and his 1956 tan and coppertone Chevy saved the day for Young America High! Thank you to Carolyn Stone Pennington for sharing this wonderful story!! Below is a list of all YAHS Principals and ECCU#2 Supts which included YAHS. 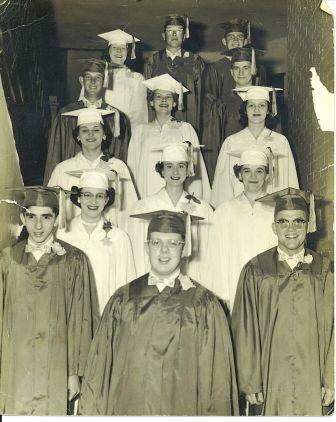 "The graduating class of 1963 was unusual in that there were 15 graduates of which there was only one girl - 14 boys and 1 girl ! Also, since Brocton-Redmon High School and Young American High School were in the same school district, they had a joint annual each year and prom. The prom location alternated each year between the gym in Hume and the gym at Brocton-Redmon High School."